I’ll admit it, this is the first Dad-Rock Tuesday that I’ve been excited about in quite a while. It’s Jimi Freaking Hendrix. Buddy used his massive thumb as a fifth finger on the frets. How can one not get excited about this? Sure, I’ve heard Purple Haze, Foxy Lady and a few others on this record before, but I was psyched to have 40 uninterrupted minutes of guitar genius wash over me. 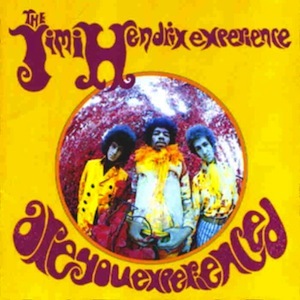 Are You Experienced doesn’t disappoint. You know an older album is good when it gets the seal of approval from Swole Ear. Usually, I’m pretty quick to label anything made before 1995 as overrated. That would be blasphemy in the case of this record, though. Believe it or not, the lyrics on this record are pretty solid as well—Jimi had more than one talent. There’s some scary stuff going on here, as Jimi actually invites us inside of his mind quite frequently. And I’m not referring to the never-ending debate between Purple Haze’s “kiss the sky” or “kiss this guy.” Hey Joe, for example tells the story of a man preparing to shoot his girlfriend for cheating on him. And then there’s Foxy Lady. Yeah. Glad you appreciate one of the masters. Your review seems to end in the middle. What else do you think about Mr. Hendrix. Also, if you want a little more background, you should read his army file. It is all over the interwebs and given what became of him, it is hilarious. Plus it is fun to picture Hendrix in the army.